AGEXPORT has several plans in the pipeline for 2019. Among them, representing Guatemala on 49 national and international events to promote exports and conquer markets like the United States, Canada, Chile, Germany, Spain and France. As part of what we seek for 2019, we are preparing a policy proposal to submit to the new government authorities taking office in 2020, with a focus on generating new employment opportunities for Guatemalans. With this proposal we expect our new authorities to focus on attracting more foreign investments and integrate rural areas in Guatemala to exporting chains. This would be achieved by detailing a series of public policies, a legislative agenda and specific projects to boost Guatemalan exports of products and services, said Mr. Amador Carballido, AGEXPORT’s CEO. AGEXPORT has also planned virtual business meetings for 2019, seeking to generate effective businesses for all members of the in real time with clients all around the world. 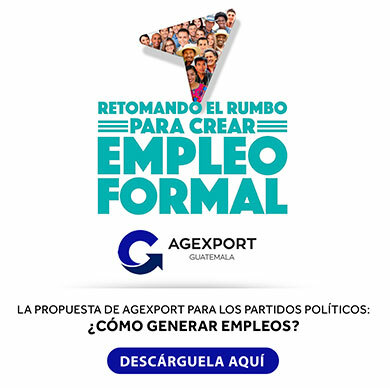 With virtual business meetings, AGEXPORT can offer a low cost, fast, comfortable and interactive way to do business with clients in countries like the United States, Canada, México, Central America, the Caribbean and South America. The virtual business meetings will take place by videocalls through AGEXPORT’s new platform Connecting Best Markets, an online tool that eases business meetings as well as allows exporters to find the ideal international market for their product and/or service.